SINGAPORE, Dec 31 (Reuters) – Asian fuel oil cracks were weaker across the 12-month forward curve on Monday, with the front-month January crack at its widest in four weeks, as demand-supply fundamentals remained weak going into the new year. The January crack widened by 55 cents to a discount of $11.26 a barrel to Dubai crude, widest since Dec. 3, according to Reuters data. High volumes of Western arbitrage cargoes continued to depress sentiment, while demand for bunker fuel was still lacklustre. 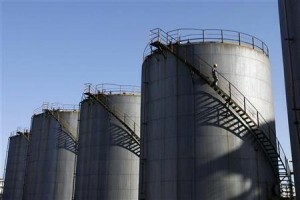 The low sulphur fuel oil (LSFO) market, however, remained supported by winter demand from the North Asian countries. Offers for February-delivery cargoes have risen to premiums of around $120.00 a tonne on a cost-and-freight (CFR) Japan basis, a trader said. In South Korea, Korean District Heating Corp (KDHC) came forward to seek 31,000 tonnes of LSFO or low sulphur waxy residue (LSWR) for delivery over Jan. 30-Feb. 6, it said on its website. Demand, however, could be limited as South Korea will restart one of the two troubled nuclear reactors this week, easing power supply concerns during the winter. The reactors were shut for nearly two months to replace parts which were found to have forged documents. Fuel oil’s prompt January/February intermonth spread was unchanged at a contango of $4.25 a tonne by the Asian close at 0430 GMT, Reuters assessment showed. – Korea District Heating Corp (KDHC) is seeking 31,000 tonnes of LSFO or LSWR, for Jan. 30-Feb. 6 delivery to Gunsan, via tender which closes on Jan. 9, with a one-day validity. – Lukoil sold 40,000 tonnes, for Jan. 18-22 loading, to SK Energy at a discount of $1.00 a tonne to January average quotes, which is equivalent to a discount of around $1.40 a tonne to Singapore spot quotes.